NZ's first swim up bar and cafe in large lagoon thermally heated pool. Lake Taupo Holiday Resort is a destination in itself with a spectacular tropical style pool with swim-up bar plus cafe, and being geothermally heated it will keep you lovely and warm year round. Located 5 minutes from Taupo city centre and sprawled across 8 hectares of park land, the resort is a hidden oasis surrounded by nature and offers comfortable, clean accommodation ranging from motels, cabins and sites for your camper van, RV or tent. Boasting friendly kiwi service and extensive, modern facilities, guests enjoy free gas BBQ's, WiFi, on-site shop and laundry facilities. A fish cleaning area is available to clean up your catch of the day and secure sites to park your boat. Activities abound and entertainment facilities include New Zealand's first swimming pool with swim-up bar and cafe. The new pool provides hours of entertainment for the young and young at heart, with a 4m deep grotto/cave, giant mushroom and play area for kids and a massive outdoor television playing movies or the latest sports game. New Zealand's largest jumping pillow plus one for the littlies, tennis courts, volleyball, basketball, petanque, chess, checkers an adventure playground with trampolines. Mountain bikes and pedal go-karts are available to hire. A short drive to Taupo town and other popular attractions the resort is also a great base for your greater Taupo adventure. Resort staff can book trout fishing, jet boating, bungy, sky diving activities and more. 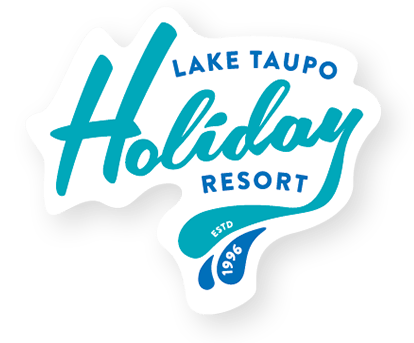 Whether on a family escape, couples getaway or group adventure, everything required for a relaxing, fun and effortless holiday can be found at Lake Taupo Holiday Resort. Experience our slice of paradise right here in New Zealand, once you stay a few days you won't want to leave..
NZ's first swim up bar and cafe in large lagoon thermally heated pool. Lake Taupo Holiday Resort is a destination in itself with a spectacular . . . More . . .